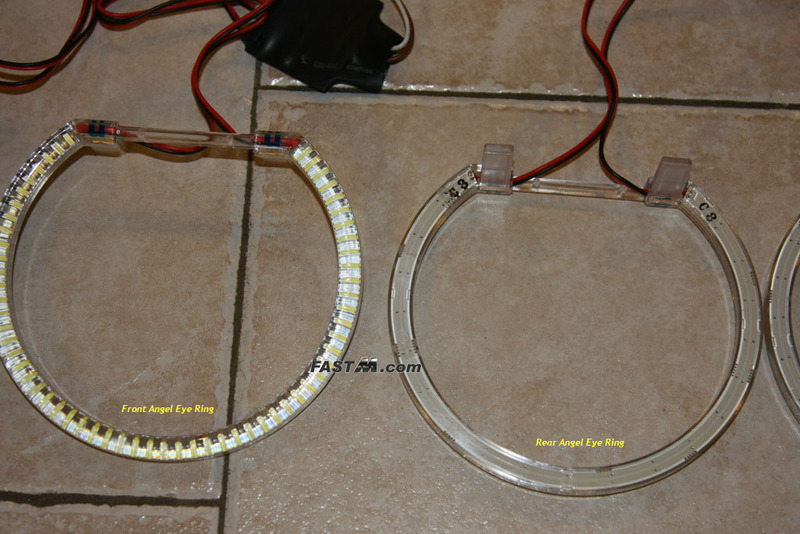 NOTE: This DIY guide was created using the Predator ORIONTM V2 60LED Angel Eye Kit only. Not for any other kit. Vehicle used: 2003.5 BMW M3 Coupe with Bi-Xenon headlights. Install should be similar for 2001-2006. 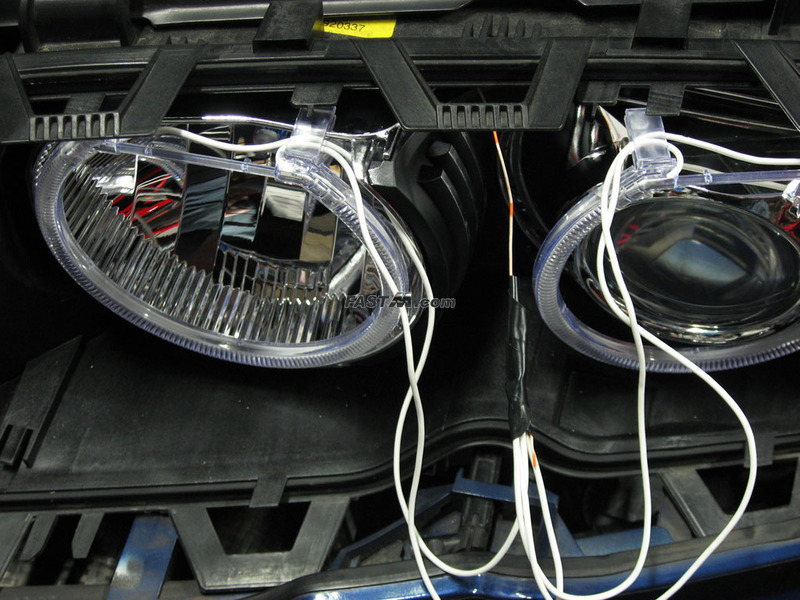 Installation below done with the standard 6000K umnitza Predator ORION V2 Angel Eyes Kit. a) Inspect and test your kit prior to installing. 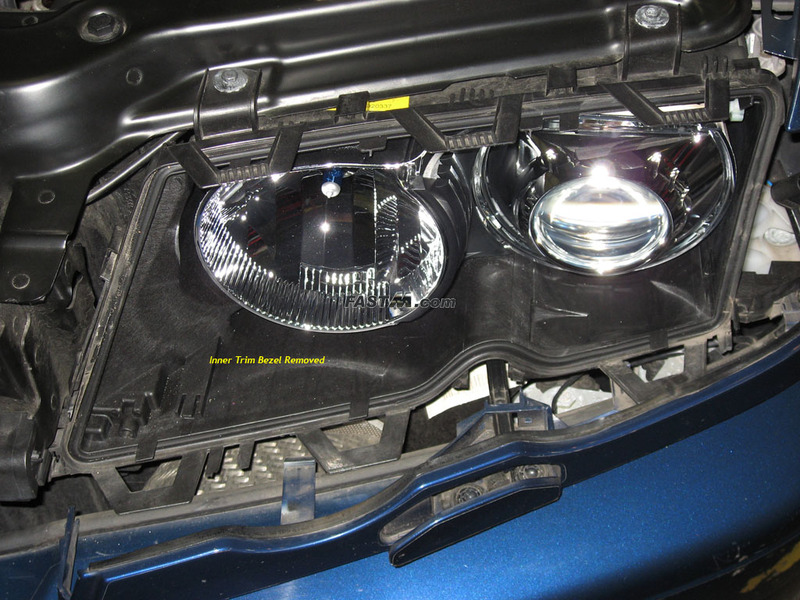 If anything is not working, best to get it replaced before taking your headlights apart. b) Pop open your hood. Unravel the wire harness and lay it out so you can easily find all the terminal connectors. Refer to this image for all the terminals. Click Here. Locate the Brown and Red wires that has the bullet style male/female terminals. Connect the brown wire from the Angel Eyes to the brown wire on the harness. Connect the white wire from the Angel Eyes to the red wire on the harness. Repeat c & d for the other set of Angel Eyes. 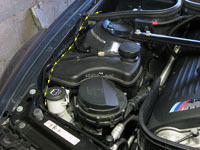 Open the hood of your car and visually locate the ground post and the positive post. 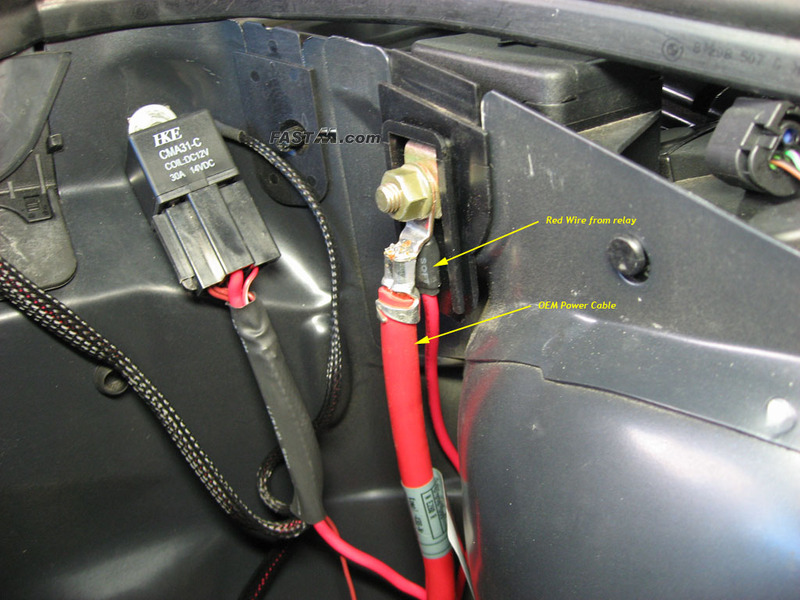 Locate the ground wire on the harness and hold it to the ground terminal on your vehicle. 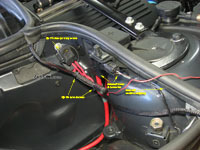 Locate the red (+) wire on the harness and hold it to the positive battery terminal. 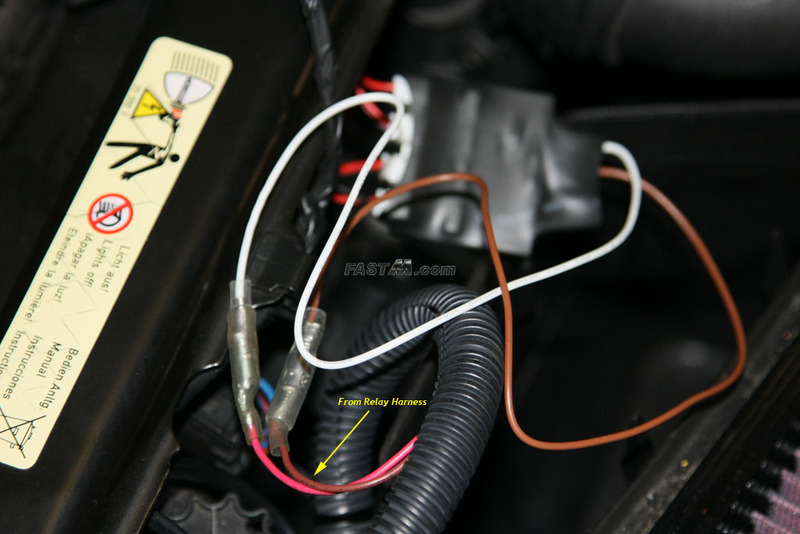 Locate the brown trigger wire on the harness and touch it to the positive battery terminal to trigger the relay to turn the Angel Eyes ON/OFF. Your Angel Eyes should turn on and bring a smile to your face. 1a) Remove the turn signal corner lamp. Use a Philips Screw Driver to loosen the retaining screw as pictured below. The screw does not come out so don't keep turning or you'll be turning forever. Once loosen, slide the corner lamp forward and undo the bulb connector. Set the lamp aside. 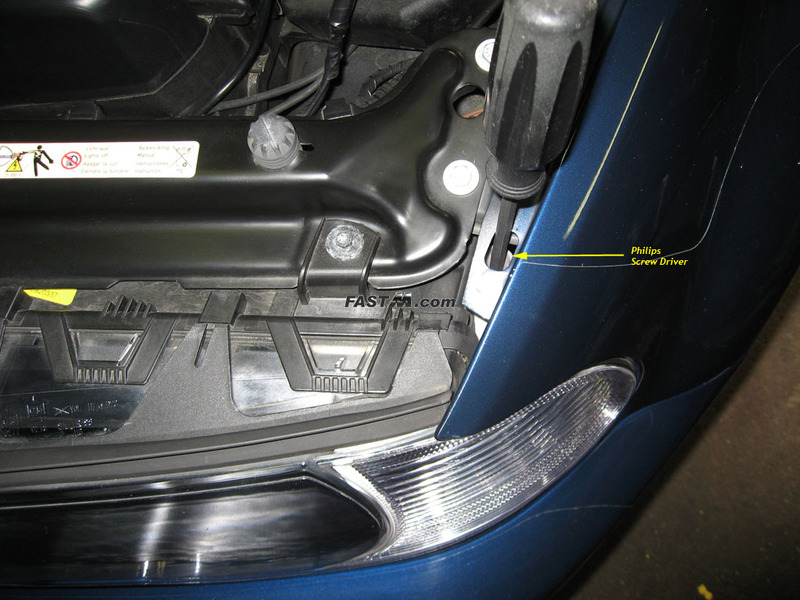 1b) Remove the rubber trim surrounding the top/side of your headlight. You can easily undo the top 3 tabs with your fingers by lifting the tabs from behind. The two tabs on side might be easier with a flat head screw driver. 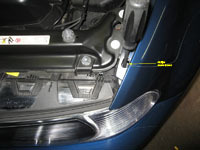 1c) Remove the lower painted headlight trim. If you have the cold weather package with the headlight washer like I do, it will be easier if you did not remove the entire trim. Start by unlatching the trim from the end closest to the grill then the latch that is visible from where the corner lamp was removed. 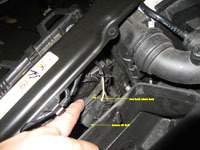 To unlatch you simply reach from behind and unhook it similar to how your removed the rubber trim. 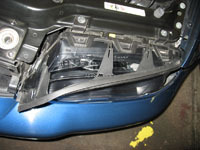 If you have the headlight washer, you do not need to disconnect it, just tilt the trim piece out as far as you can. That should give you enough clearance. 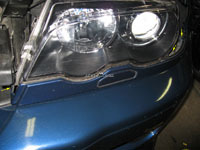 If you do not have the headlight washer it's up to you if you want to remove it entirely or just tilt it out. 1d) Remove the clear headlight cover lense. Tools aren't really necessary here. There are three plastic tabs on top, one on the side, and three on the bottom that must be unlatched. Carefully pull up on each tab till it releases from lense. As you work your way around each tab you should be able to remove the lense by sliding it out. 1e) Remove the OEM inner trim bezel. The bezel simply pulls straight out. No tools needed. 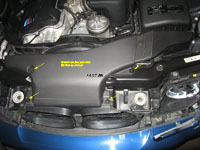 1f) Repeat the above steps on the passenger headlight. 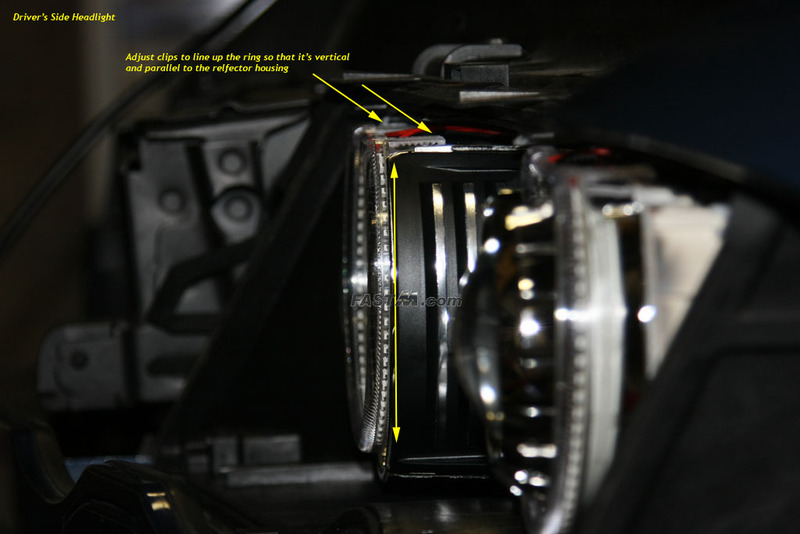 2a) Mount the Angel Eye Ring to the DRL (Day Time Running Lights, also called High Beam Flasher). At the top of the reflector is a lip. Simply slide the alligator clip at the top of the Angel Eyes onto the top of the reflector lip. See image below for proper spacing of the clips. You do not push both clips all the way in, only the inner clip (closest to grill) is pushed all the way while the other clip (closest to the Bi-Xenon projector) has some spacing. The easiest way to do this is to slide both clips in till the ring lines up with the outside of the reflector. Now look over the Angel Eye ring to make sure it's even all the way around and lined up. Take a view from the front and make sure the sides are even and the ring is centered. If not shift it to the left or right to center it. 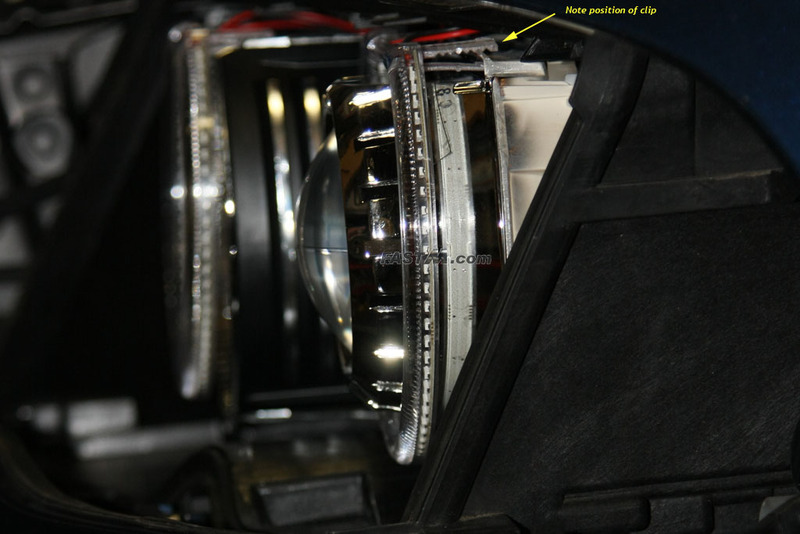 2b) Mount the Angel Eye Ring to the Bi-Xenon projector. 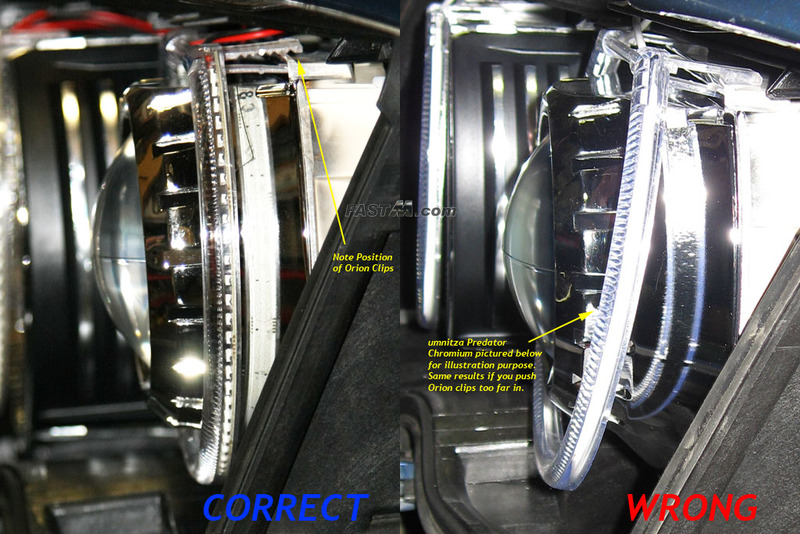 The same process applies to ring for the headlights. Push the clips in till the ring lines up. Simply push it till it gets within 1-2mm from the top of the projector housing. The ring should be completely vertical when looking at it from the side. See image below for the correct and incorrect way to installing it. 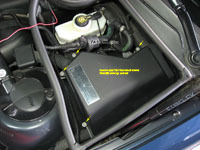 2c) (Optional) Remove the intake duct from the air box. 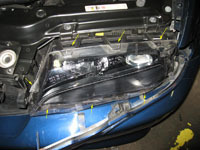 This will provide additional room to work behind the driver's headlight. 2d) Remove the H7 bulb from (flasher) socket and peel the rubber boot back. 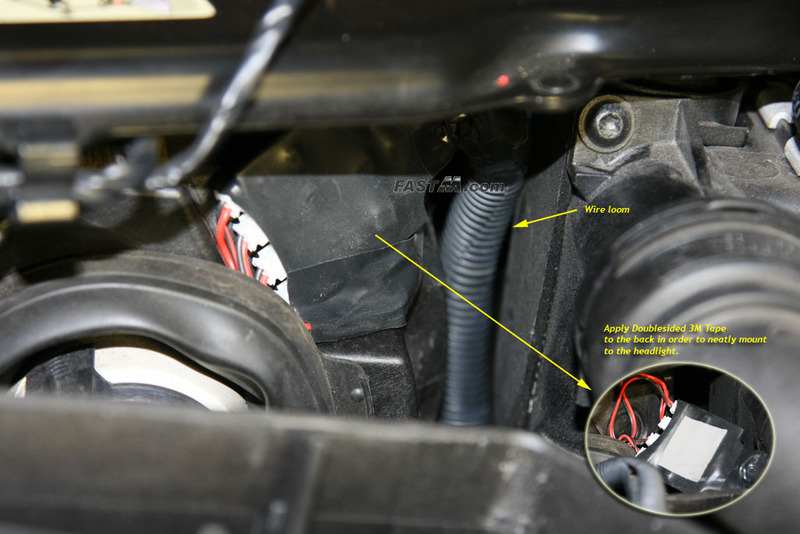 Surrounding the H7 bulb socket is a rubber boot. Peel back on the boot from the top to allow you to pass the Angel Eye wires through. 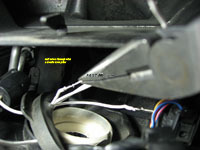 2e) Feed the Angel Eye wires from the front (above the reflector) to the back through the rubber boot. First unplug the four connectors from the wire harness. 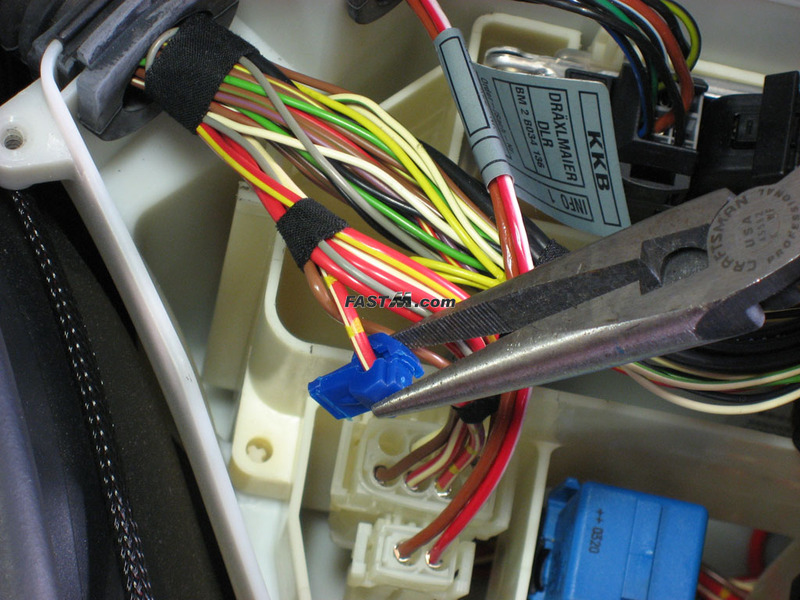 Second, to aid in the process, a thin copper wire will help you pull the wires through. 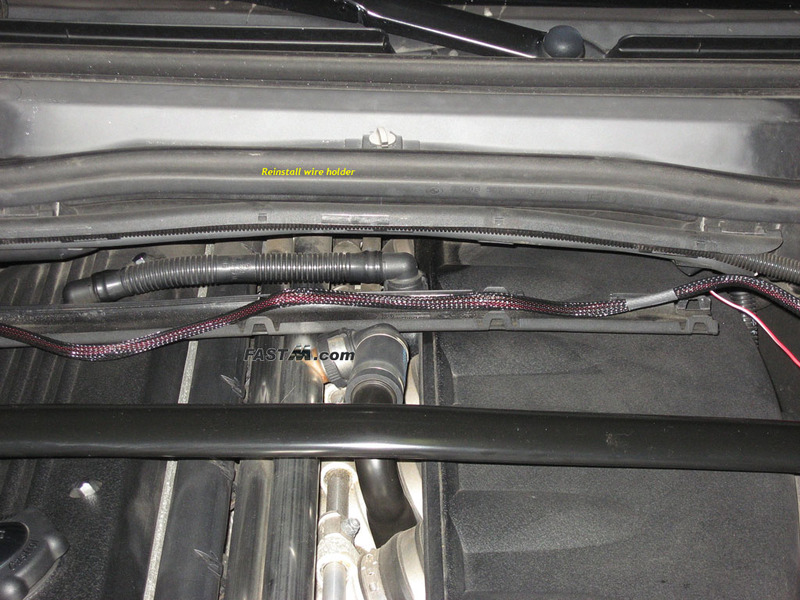 Feed the thin copper wire through from the front to the back and through the boot opening. 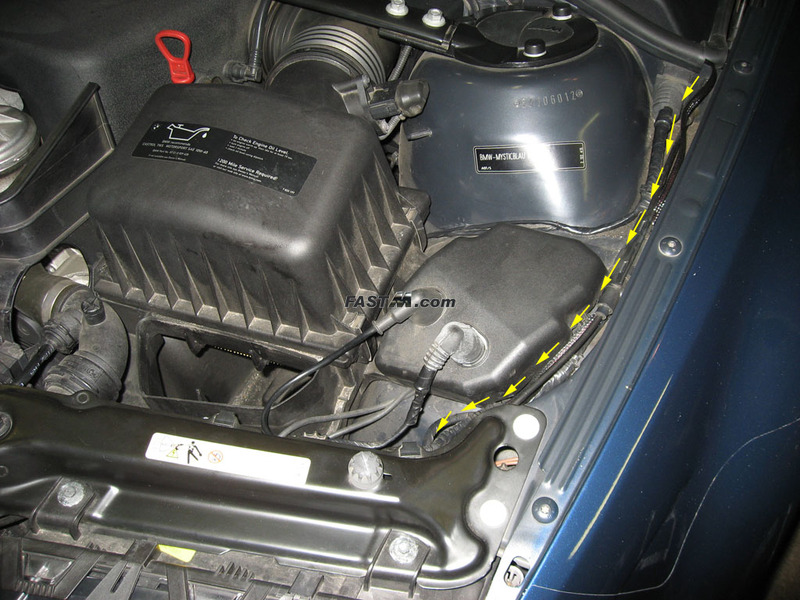 Wrap the wire around the Angel Eye wires and tape it down with electrical tape. Now pull it through from the boot side (back of headlight). Note, example images below are from a previous install using the umnitza Predator Chromium, however the process is the same for the Orion V2. 2f) (Optional, not recommended, skip to step 2g) Make a small incision on the rubber boot with a small pocket knife and feed wires through boot. This will allow you to pass the wires through the boot and also allow you to reinstall the boot around the socket opening without any gaps. Using needle nose pliers, grab one of the Angel Eye wires by the terminal and stick it through the boot opening that you made in the previous step. Then on the other side of the boot, use your needle nose pliers again to pull the wire through. Do this for the other 3 wires till all four wires are through. Note, example images below are from a previous install using the umnitza Predator Chromium, however the process is the same for the Orion V2. If you used this method, then skip to step 2h. 2g) (Only if you skipped step 2f) Bend wires around housing. Bend the wires around the headlight housing on the flat part of the bezel, not the raised part where the boot latches on to. (See image below). 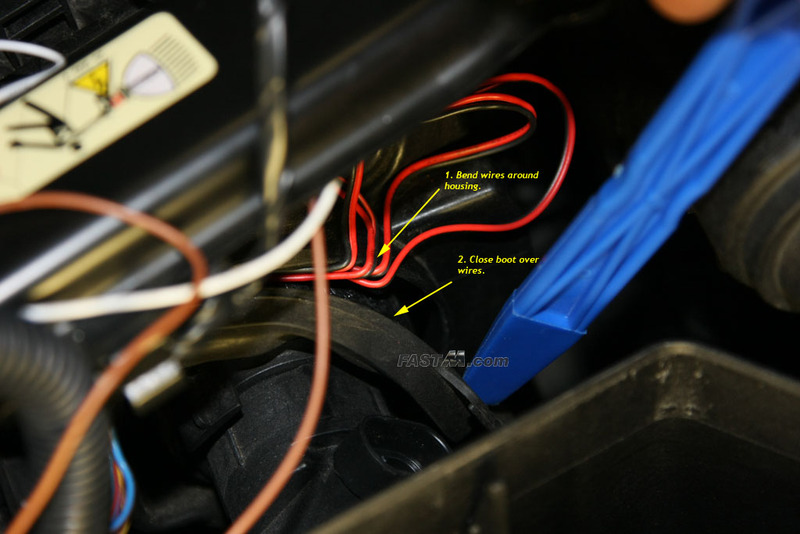 2h) Connect wires and close the rubber boot. Since the wires come preinstalled with connectors, you can't get this wrong. 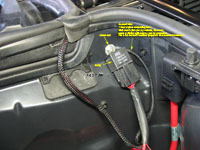 Plug each of the four connectors to the harness. (Optional: I used some 3M double sided tape to secure it to the back of the headlight. I also used electrical tape around the connector and wire loomed everything to give it a factory-like appearance. You can now reposition the boot and reinstall it.) You can now reinstall the H7 bulb. 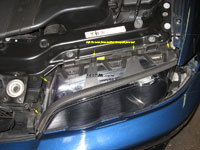 2i) Repeat the above steps on the passenger headlight. 3a) Lay the wire harness on top of the engine bay. 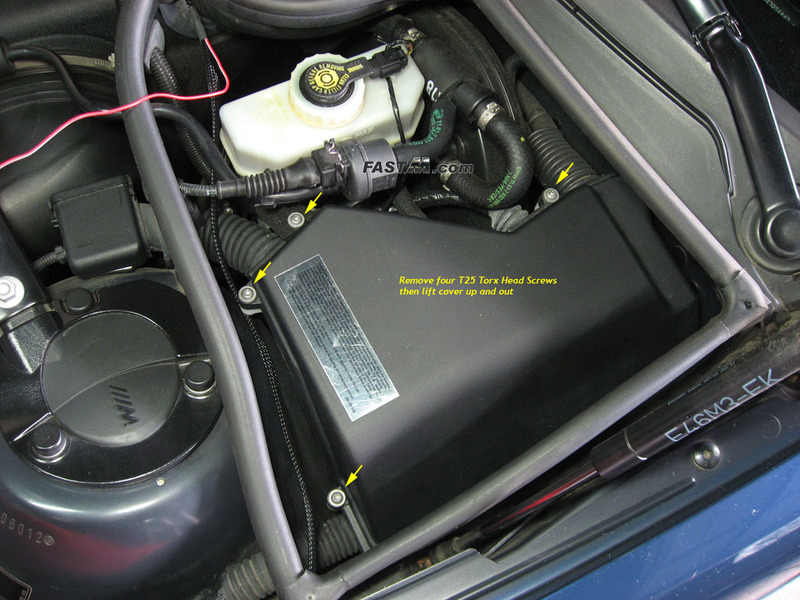 The relay should be near the passenger side positive (+) battery terminal. See image below for the correct positive terminal. The shorter end of the harness coming from the relay should follow the passenger fender to the passenger headlight. 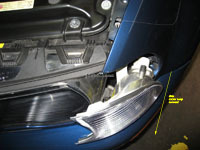 The longer end should go across the engine to the driver's side fender towards the driver's side headlight. 3b) Ground the relay. 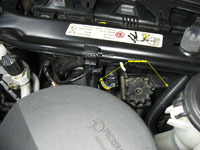 Use a 10mm socket to remove the 10mm nut located in the passenger power terminal area. Mount your relay and ground here. The ground wire is the short black wire coming out of the relay with a ring terminal at the end of it. See picture below. 3c) Route the short harness to the passenger side headlight. 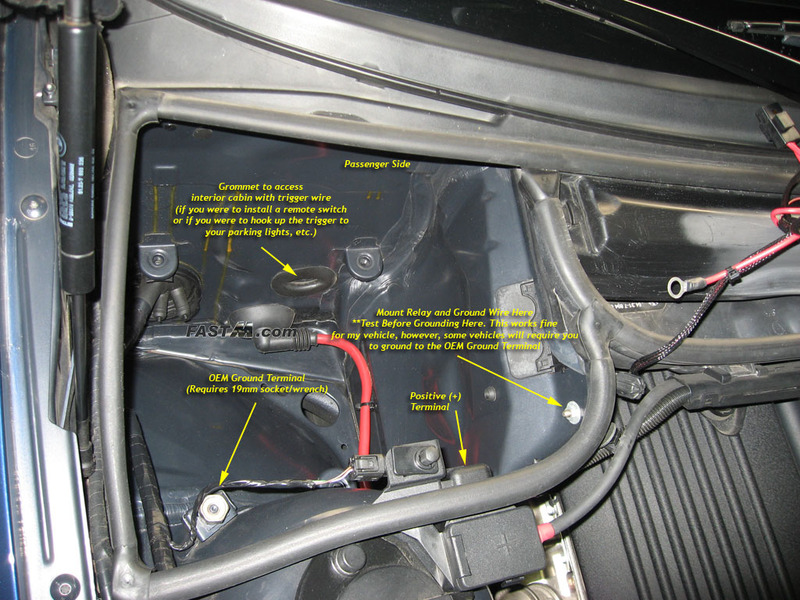 If you lift the weather stripping from the passenger side power terminal area, you can slide the harness under the factory harness bundle then route it down the passenger fender to the passenger headlight. 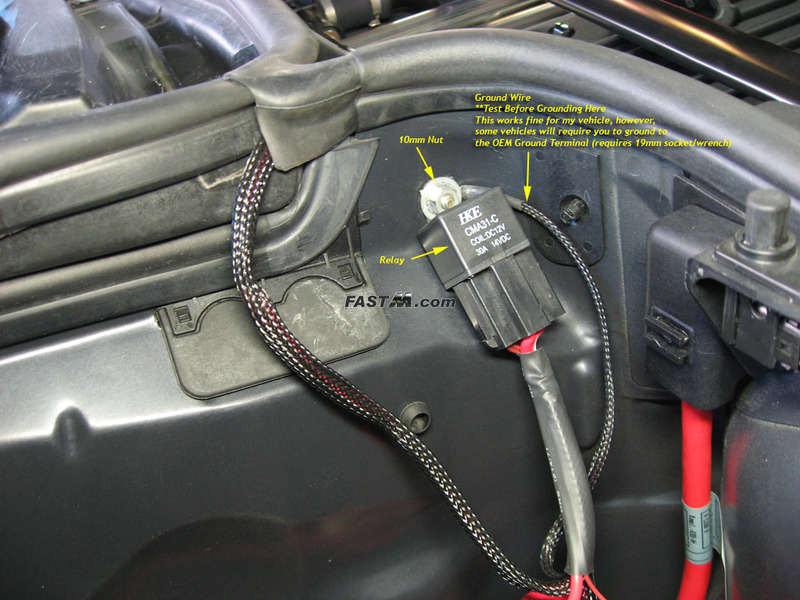 3d) Connect the passenger side angel eye harness to the relay harness. 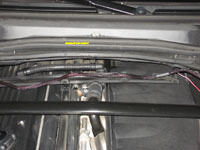 3e) Route the long harness across the top of the engine and secure it over the OEM wire holder. See pictures below. 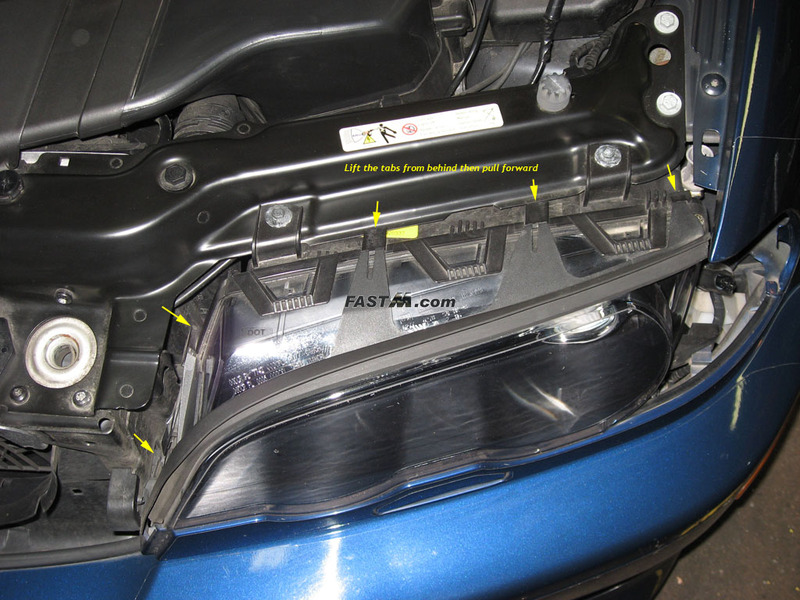 3f) Route the long harness through to the brake fluid / ECU box area then down the drivers side fender. I chose to go through the OEM weather stripping as pictured below. Leave the trigger wire in the ECU box area for now and run the harness down the drivers fender (being as neat as possible). 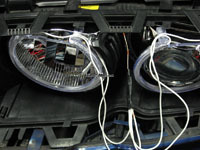 3g) Connect the driver's side angel eyes harness to the relay harness. After running the harness down the driver's side, connect it to the Angel Eyes. 3h) Connect the red wire from the relay to the positive (+) terminal found in the power terminal area. First you must locate the OEM hood switch and unplug the connector. Next lift the weather stripping out of the way then lift the cover up by grabbing under where the positive terminal is. See first picture below. Use a 13mm socket to remove the 13mm nut from the positive terminal. 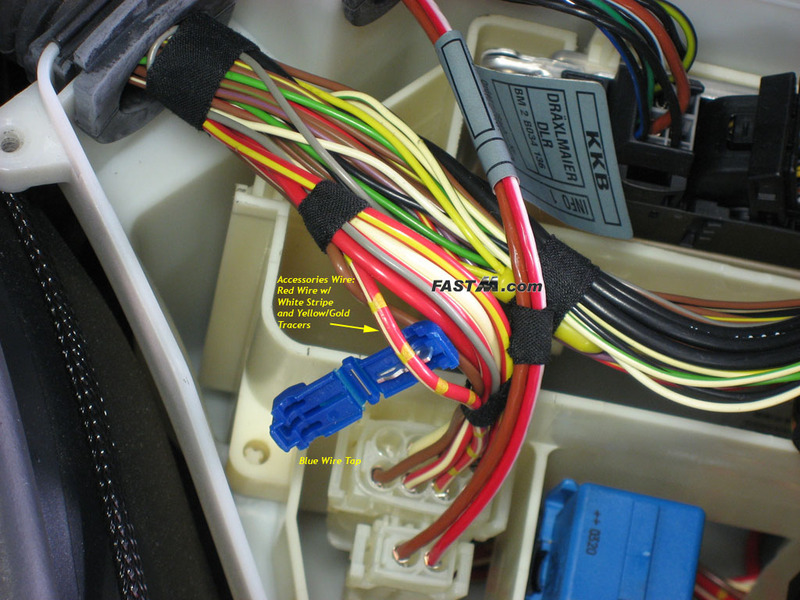 Locate the red wire (with an inline fuse) coming out of the relay and mount it on the positive terminal. I chose to install the red wire underneath the OEM battery cable. Do the reverse to put it all back together then zip tie any lose cables. 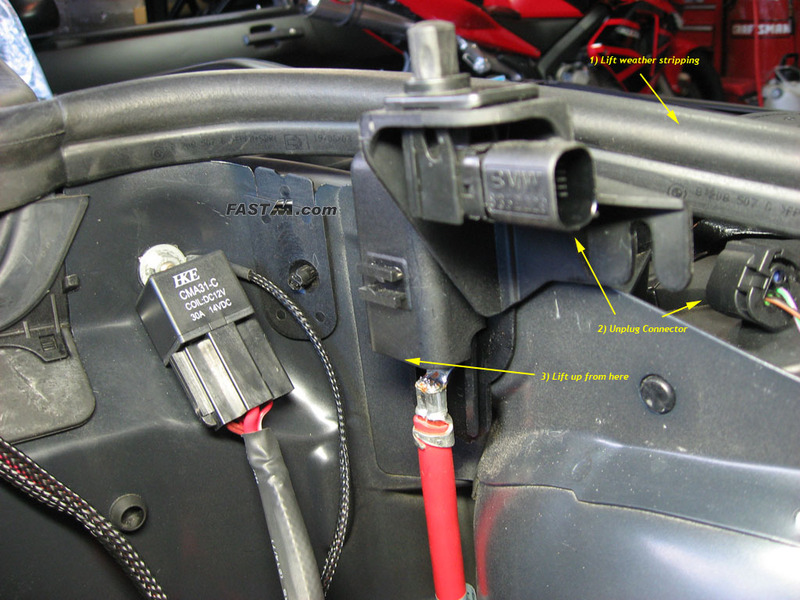 TIP: If you zip tie the inline fuse holder to the relay as pictured below (3rd pic on the right) you'll have easy access to the fuse). 3i) You are now ready to test your Angel Eyes. Coming off the relay should be a second trigger wire that is brown. 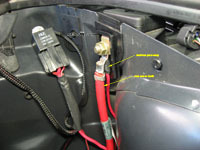 Have someone touch the brown wire to the positive terminal or use a clamp then examine if your Angel Eyes work. If all is good, remove the brown wire from the positive terminal. 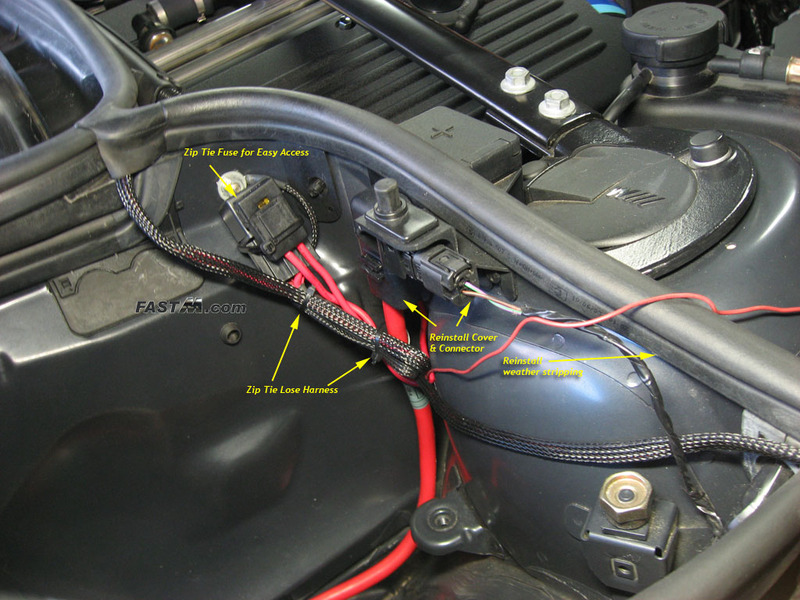 Note: The Accessories wire method is one of many ways to wire the Angel Eyes. 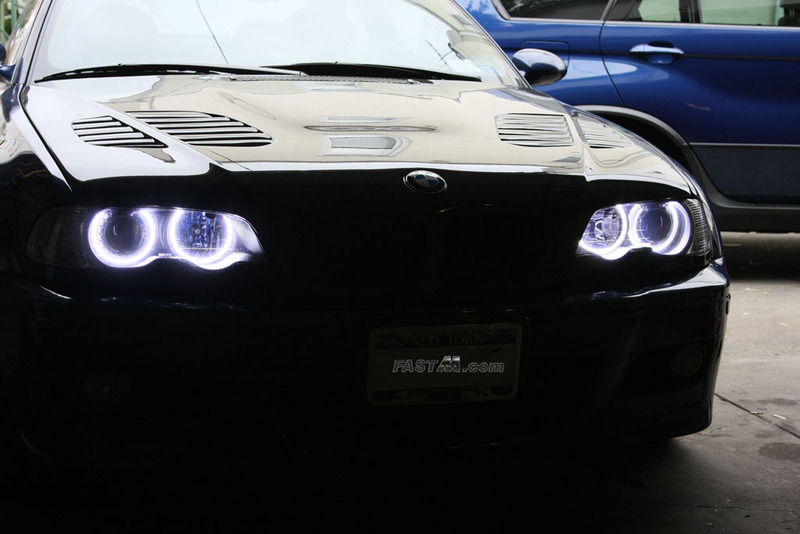 This method will allow you to have the Angel Eyes on all the time whenever the car is running. This is independent of whether your headlights/parking lights are on or off. 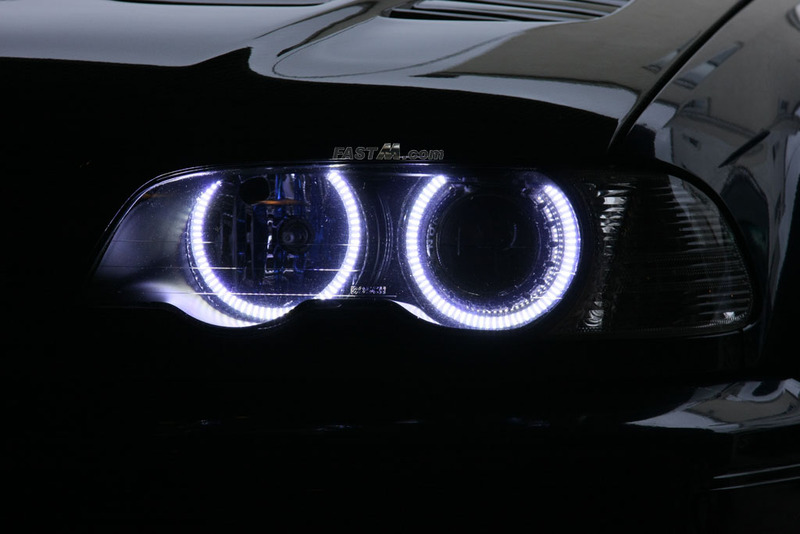 When you turn off your car, the Angel Eyes will stay on for a few seconds since there is still power through the accessories wire. This will not cause any power drain issues as the Angel Eyes do not draw a lot of power. Skip this step if you do not want the Angel Eyes on all the time. 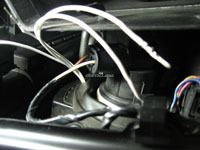 You can search the forums such as m3forum.com for other wiring methods. 4a) Open the cover to the ECU box using a Torx 25 bit to remove four Torx head screws. (Note: Some earlier cars might be HEX 27). Once the screws are removed, tilt the cover up and pull out. 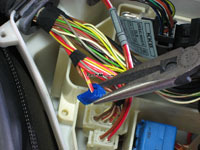 4c) Route the red trigger wire into the ECU box and connect the terminal end to the blue wire tap. I chose to lift one of the rubber grommets and lay the red trigger wire underneath. You can fish it through the grommet if you like for a more professional look. 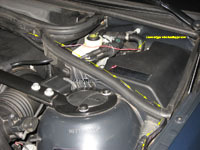 4d) Test the Angel Eyes by turning your ignition to position 2. If your Angel Eyes light up then you are good to go and you can begin cleaning up the loose ends. 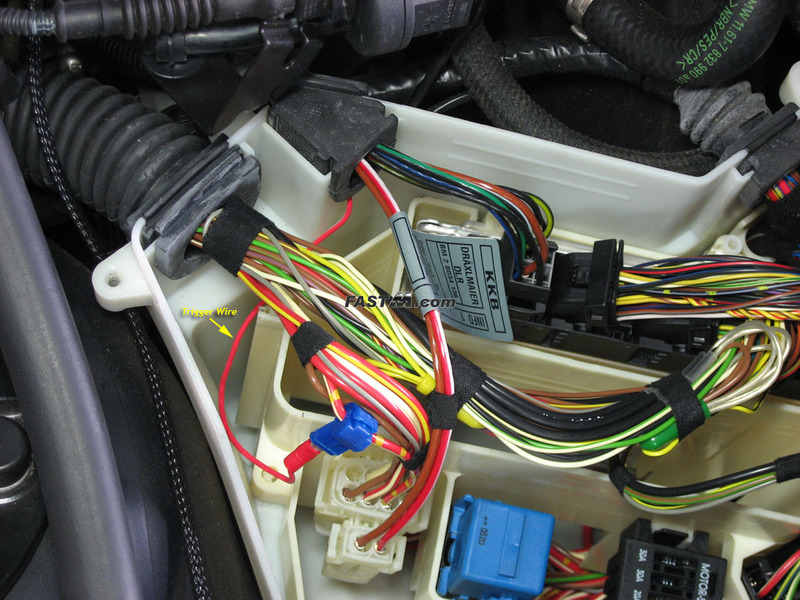 4e) Reinstall the ECU box cover at this point if your Angel Eyes are working ok.
5a) Tape the 2nd Trigger wire. If you are not using the second trigger wire (wire closest to relay), you should tape it using electrical tape and tuck it away. 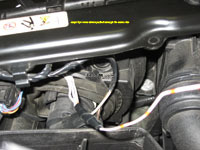 Make sure to tape up the connector end so that it doesn't accidentally get in contact with the frame of the car. 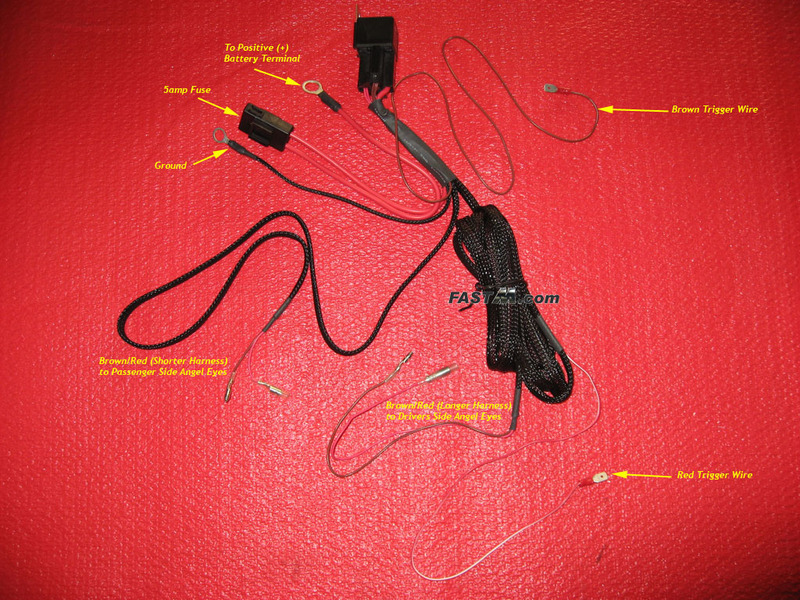 5b) Zip tie the harness. Using zip ties, secure the harness down along the fender, etc. 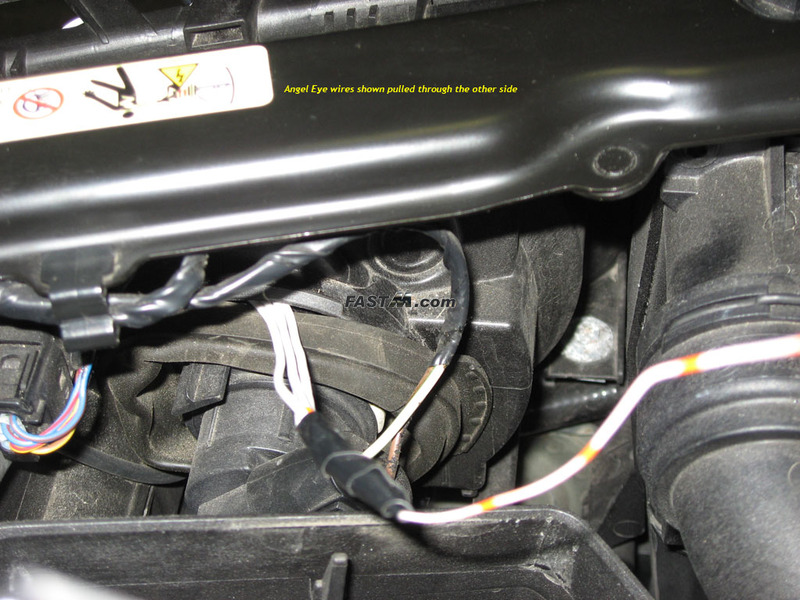 Make sure no wires come in direct contact with the engine. 5c) (Optional, assuming you made a slit on the rubber boot from steps 2f) Use silicone or liquid electrical tape over the incision area on the rubber boot where the Angel Eye wires were installed. This should prevent any moisture from possibly getting into your headlights. 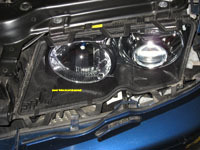 5d) With the lense still off the headlights, check the Angel Eyes to make sure they are still aligned and in the proper position. 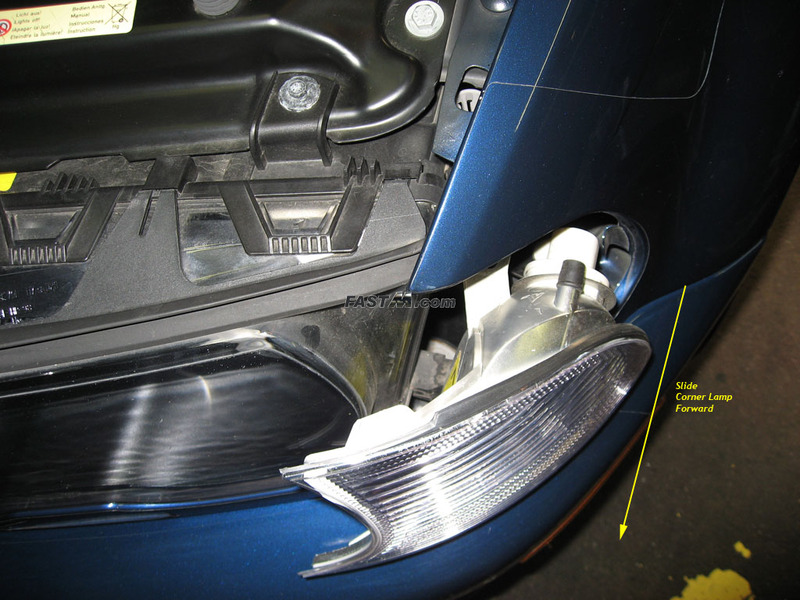 5e) Reinstall your headlight inner bezel. When reinstalling the headlight bezel, pay attention to the outter ring of your Angel Eyes. If you see the top is compressing the Angel Eye ring, you might need to move the Angel Eye ring further back. If you can not adjust the ring any further, you can leave the outer corners of the bezel loose. (i.e. do not snap it in place). If you snap it in place it will push the Angel Eye ring too close to your projector housing and possibly interfere with the self leveling adjustments or rub off the chrome on the surface of the projector. It will be fine to leave these two corners loose. 5f) Reinstall your headlight lense and trim following the reverse procedures you following for removal. 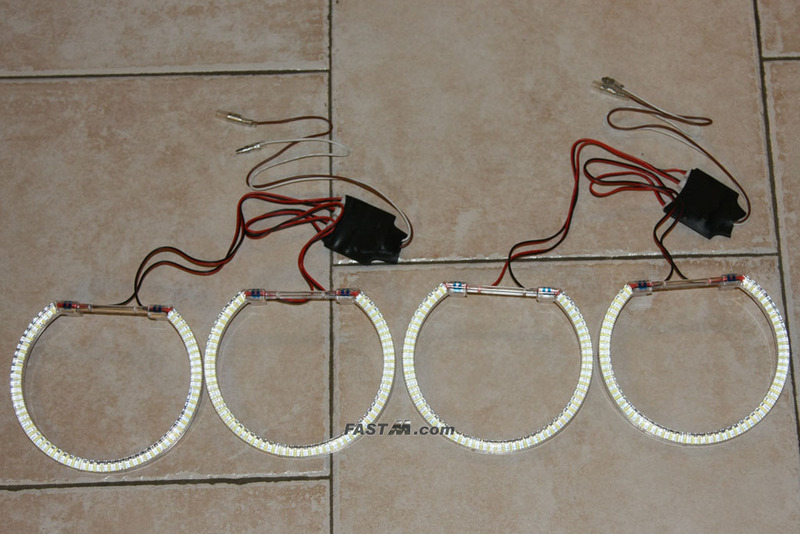 5g) Using some wire loom, dress up the wires coming from the back of the headlights, the wires from the angel eyes, etc. 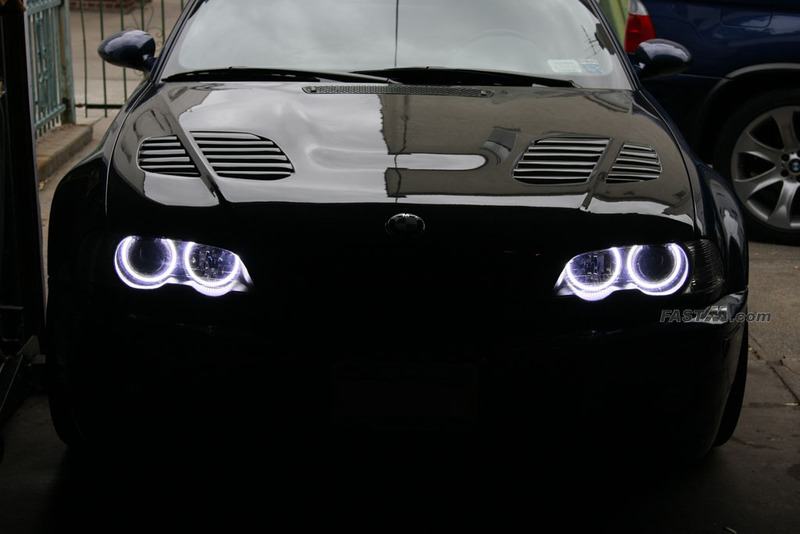 Step 6) Go out, drive your car, and enjoy your new Angel Eyes!!! 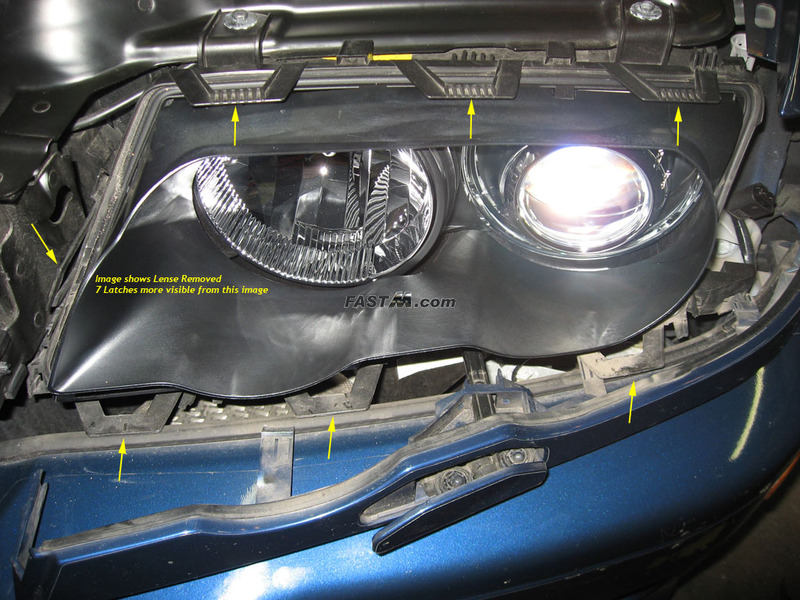 Disclaimer: This guide is for reference only to show you how I installed the Angel Eyes on my vehicle. I am not responsible for any injuries or vehicle problems you might have following this guide. Contact: If you have any issues with this product, please visit Umnitza's web site and contact them directly. I am not affiliated with Umnitza.